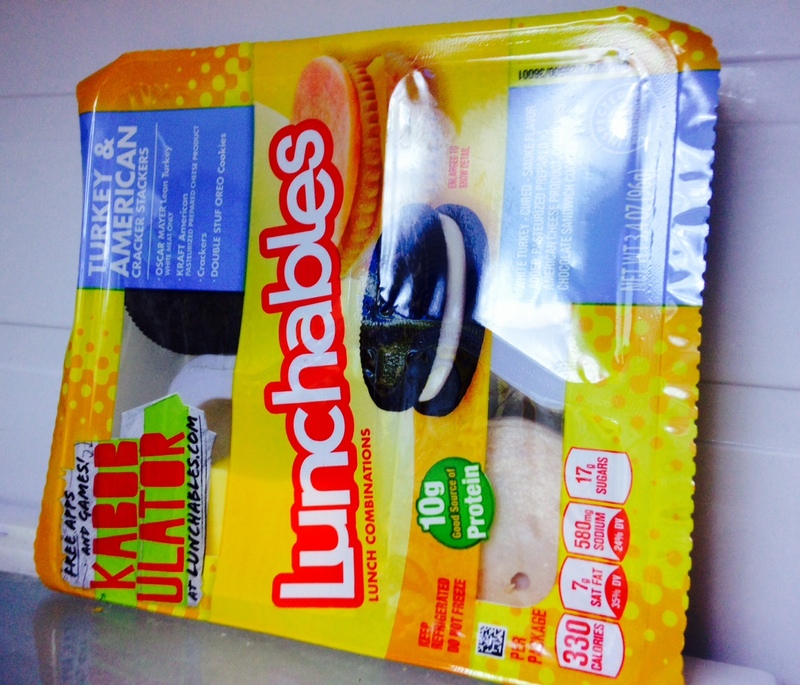 I bought this portable meal, a Lunchables, to give to a homeless person. So why is it still sitting in my refrigerator? Last week I planned to give this lunch to the next person I saw holding a “Hungry & Homeless – Will you Help?” sign as I waited in my car for the traffic light to change on a busy boulevard in Jacksonville, Florida, a city that attracts the destitute for several reasons including its mild climate. Sure enough, I was first in line at the red light leaving the grocery store, and I spotted a downtrodden young woman looked eager for my help. I popped the trunk and jumped out of the car, intending to offer her the lunch, but she declined, “No, ma’m. That won’t help at all. I need $ 99.00 to blah – blah – blah.” No, I didn’t give her $ 99.00 because I never give cash to the homeless. Instead, I give to the needy through our church or through homeless shelters in town. Yes, I did feel cynical as the light turned green, knowing the woman was probably scamming people. No, I will never stop feeling sorry for the “homeless” regardless of their intentions whether it’s a real physical need to survive, untreated mental illness or something else. 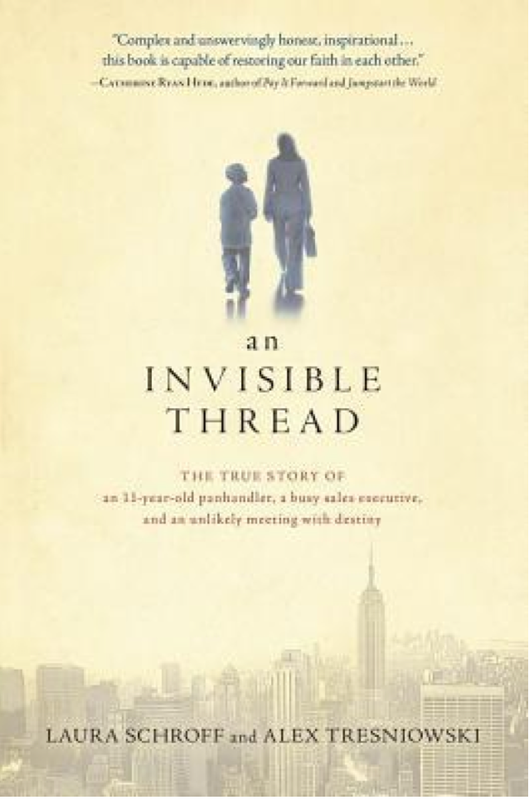 On my nightstand sat a copy of The Invisible Thread: The true story of an 11-year-old panhandler, a busy sales executive, and an unlikely meeting with destiny. It was time to read it! 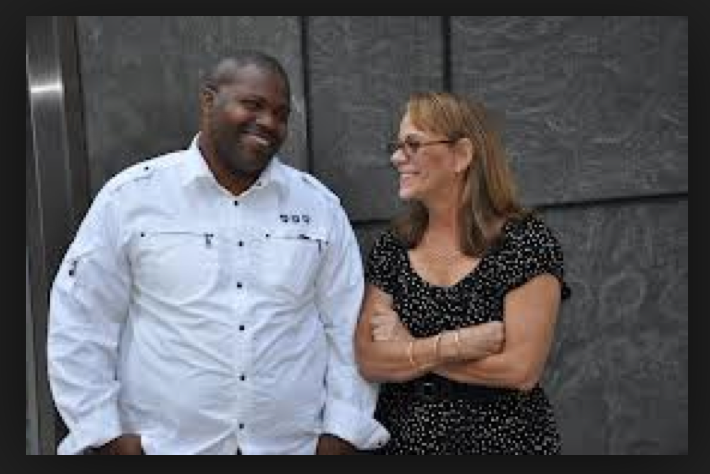 Laura’s memoir, reminiscent of The Blind Side, interweaves three dynamic narratives: The first, the story of Laura and Maurice’s growing relationship. Secondly, Laura’s back story as both victim and then survivor of her dysfunctional home. And finally, Maurice’s maturation into an adult with a family of his own, reflecting what Joseph Campbell calls “the hero’s journey” often fraught with obstacles and setbacks. I began reading the book because I was intrigued by the disparity between an accomplished woman in Manhattan and a needy young boy from Brooklyn. I was compelled to read on because I wanted answers: Why would a young woman who helped make USA Today and InStyle successful publications risk all to build trust with a young man who had nothing to offer in return? How did an ill-kempt beggar boy, who has since developed a career in construction and is raising his own family, enrich that woman’s own life? In the end, Author Schroff realizes that both she and Maurice had traveled together on a voyage of self-discovery. Her message: “This is a book about how, if we learn to let go of fears and burdens and expectations, we can find ourselves plunged into the sweet, unplanned blessings of life” (book blurb). But maybe . . . if you are someone with the incredible courage of Laura Schroff, there is still another answer. Thank you for this interesting and compassionate post. I think most people (or I’d like to think most) people face that struggle–to give or not to give. Like you, I give money to organizations. Other people I know work at food banks. Thank you for the book review, too. Laura Schroff was courageous, and her decision, it seems, enriched her life, as well as the young boy she helped. It does seem that she took a big risk though, and perhaps that is due to her own backstory. I agree, Merril, I do think her own stormy upbringing caused her to be more receptive to Maurice’s deep need. On so many levels, she took a big risk, as you say. The narrative points out that all along the way her colleagues and family were monitoring the situation, anxious about her welfare. As the relationship progressed without incident though, they started to relax and even inter-act in family gatherings. Thanks for the book recommendation, I will check it out. Your husband is a Good Samaritan – love in action. Thanks for sharing this heart-warming anecdote, Darlene. A very moving story. I believe each and everyone of us should follow their own heart and conscience. I tend to give money to buskers who play good music, human statues or street performers who put on an entertaining show! These people you describe are actually giving of themselves. In that sense, the giving and receiving is practically an even exchange. In my opinion, art entertains and inspires however it is expressed. Good for you! Marian, This post really got to my heart and I’m ordering the book. As an intuitive, I give money to panhandlers when something about them makes me stop. Other times I give out bottles of water or snacks. I will never give to someone who says what I have to offer is not enough. There are as many truly needy good people out there as there are not-so-nice needy people and it’s up to each of us to do what our heart directs us to do. Thanks for this lovely reminder that there are wonderful things happening out in the world. Marian, the video had me in tears. What a poignant story of breaking down barriers and forging lasting friendships. I feel compelled to order this book! Taking risks when our heart feels compelled to reach out can be a dilemma. You raise such a good point about not giving a needy person money but offering to feed them. Your heart is definitely in the right place and we never really know if it’s scam. Thank you for sharing this story and reminding us that there are good people in our world. Kathy, you will enjoy the expert braiding of stories. Actually, there were four narratives including the story of the challenges in her marriage as she continued to build a relationship with Maurice. Marian — Like you, we give our charitable donations—including the local homeless—through organizations that ensure the money is spent wisely. I’m so glad you shared AN INVISIBLE THREAD in your post. I’ve just added it to my reading list. Reading the book will entertain and inspire you, Laurie. A book review leaves out so much detail. You’ll savor all 230+ pages! A touching story of taking a chance, reaching out and caring for the whole being of a person, the choice being whether the recipient receives the love shown or not. This sounds a lot like Joan’s comment about the will and receptivity of the needy person. Thank you! On another note: Thanks so much for proofreading my posts and suggesting edits and revisions. You are so right – and if they don’t accept food, then there is something else going on. As you know it’s more blessed to give than to receive, but receiving is a grace too. Thanks, Debby! Bravo to your lunchables offer. This also reminds me of The Soloist book and film–have you read it? So many complexities here and I know I would enjoy the book, Invisible Thread. I’ll have to watch your video link later as my home computer set up is not good with videos. Yes, Melodie, I do remember The Soloist which came out more than five years ago. As I recall, one of the main characters was a journalist, just like Laura, but the other character was older and a homeless schizophrenic. This story too had a happy ending. Thanks for mentioning this movie, with many parallels to An Invisible Thread. I hope you can see the video. It’s a poignant summary. And not very long! I would love to think that I would be as courageous as that lady in the story but like most of us we would be wary …three cheers for her bravery . I’m over to kindle for that book thank you Marion great post . This story certainly has galvanized readers to action: both to read the book and be more gracious in giving. Like you, Darlene’s husband golden deed was so inspiring, and the perfect solution too. I do give money to the homeless – most of them are cripplingly poor Romanians who can earn more money here by begging than living in utter poverty in their own country. You are doing the right thing by following your heart. I have a hunch that those poor Romanians are fighting to survive, not scamming people with false claims.Thanks for this mention, Fiona. And when people just give of themselves, that’s the best gift. Being generous is a way of life for big-hearted people like you and other commenters here. I guess the key is to use discretion. Thank you very much for this thought-provoking entry! I’m lucky to live in a rural area where I seldom encounter panhandlers, but I do have the same kind of moral dilemma in the rare circumstance when I do. It’s good to hear other people’s perspectives on this topic, especially yours. I haven’t read an Invisible Thread yet, but now I intend to. Thanks again! Rebecca, you are joining a slew of people who are reading or want to read this book. When we are thinking about others we tend to dwell less on our own problems. At least that’s how it works in my case. Thank you for adding to our conversation here. Thank you for this great post. Working with people most of my life and helping them get on their feet or making sure they have all they need to live comfortable with their children. I give to people on the street. It doesn’t matter what they use it for. My heart is for God and that’s what I want them to see. I tell them may God bless you he loves you. If it helps them to hear that even if it’s only once it’s worth it . We have to be salt on the earth. We can only plant seeds and pray that God touches their life. All we have is God’s. I help people through agencies. It is so hard for people today to get help. The bar is so high that they can’t make it to get the help they need. I’m meeting with our board to go back to helping those in need rather than to give it to agencies that don’t help them. People need to see God in us. Homelessness is growing. I’ve seen this up close and personal and lost her through it. It’s more why I give to help:one kind word and remind them could make a difference. I don’t know maybe when I get to heaven someone will say because of you I was saved, my prayer. Your gracious giving helps those receiving glimpse the face of God if only for a few seconds. In your capacity as social worker, you do see human needs up close and personal. I’m glad this post touched you too. Thanks for your heart-felt comment, Gloria. I also have turned my car around and gone back to talk with and give money to a woman who said she’d been looking for a job and needed money. Maybe, I was scammed. Since then my donations have gone to charities to help the poor. I honestly would not have the chutzpah that Laura showed here, but I can admire it full force. I do think her own stormy childhood played a huge role in the way she empathized with Maurice’s plight. There are times when I can identify with the challenging times that some go thru. I also recall my folks helping a farm worker who was fired in the dead of winter and had no place to go and unsure of where he’d be able to find work. We follow the examples of our fore-folks. I know I do, probably instinctively. The fired farm worker probably imagined he was at the end of his rope – and help came at just the right time. Wonderful! Wow, what a great story, Marian. I have always struggled with this issue also. And I’ve tried many ways to try to deal with my feelings and questions. I have given, and not given (more usually) money. I bought a blanket for a woman and given food to panhandlers. I can’t walk past a beggar without thinking of Matthew 25. What Laura did and how Maurice responded has already touched my heart. And I haven’t read the book. That’s the power of your words and the video. Hope to read the book. Thanks for bringing it to my attention. I didn’t say much about Laura’s story but it is braided neatly into the larger narrative. As an author/storyteller you will enjoy observing the structure/story arc. You probably noticed too Laura had a co-author. I am so sorry it has taken me a few days to respond to your blog. I so appreciate that you would write such a beautiful and thoughtful review of my book. I am so touched and honored to be a part of your blog, PLAIN & Fancy. When my book came out almost four years ago, I never could have imagined it would take me on such an amazing journey. When Maurice and I met almost 30 years ago, we did not know it was “an invisible thread” that connected us and how we were destined to meet. Maurice, my co-author Alex and I feel so blessed to know that so many people across the country and now around the world are embracing our story and are helping to spread how once small act of kindness can make an enormous difference. My deepest thanks to Marian and to ALL for taking the time to share your thoughts. I am truly touched. How gratifying to know that your heeding the call to action so long ago has brought such inspiration and encouragement to so many. Therein lies the magic. No worries about the delay in commenting. You’re a busy woman – and doing good, I shall surmise – ha! Thanks again for honoring me and my readers with an acknowledgement here, Laura! Marian, this is a timely, thoughtful and compelling post. Well done. Years ago, after swearing off helping the sign-holders because of a warning about scams, I came across a mother with two very young children. Long story short, I took them into the grocery store with me, and as I bought my groceries I bought them what she said she needed most: disposable diapers, diaper rash cream, milk, bananas, oatmeal, bread, peanut butter, baby food, and some canned soup. I also got some pears and sandwiches at the deli for the mother and older child). The clerk bagged their groceries separately and I paid for everything and kept the receipt so they couldn’t be returned. When she went back to her old car with her food and her children, the little boy hugged me as his mom thanked me when I gave her the phone number for the women’s shelter, and some quarters to call. I don’t know if I was scammed or not, but I remembered my mom saying that sometimes what we are led to do is help; it is up to God to deal with it if the help wasn’t needed. I’m so glad this post struck a chord with you. Your story has all the marks of a woman fleeing a desperate situation. Obviously, you did the right thing because you followed your heart, and in the end you probably felt blessed by being able to give. I know I would. Thank you, Marylin. I am so enjoying reading all of the post. They are truly amazing and thank you so much to sharing my story! I am blessed with wonderful, wonderful followers. It was a joy to share such good news in dark times. Thank you for your kind heart, Marion. I don’t give to people standing at red lights and also try not to give cash. I take people to restaurants if I can. Sometimes I can’t so I just give them $5. It probably doesn’t go to healthy food, but sometimes I simply know that I have enough and this person in front of me does not. Elaine, the words “recognize their humanity” really jumped out at me. I think that’s why I am drawn to helping people regardless of the nature of the need. You are that way too, I see. I feel the same as you about giving money that might be used for drugs and alcohol. It’s hard to escape the guilt of turning away though, just in case that person is in genuine need. Like you I will give physical things but not cash. Sadly things are not always well received. It’s a a quandary, like you suggest. Several of the commenters told how they deal with the needs of the less fortunate. I’m coming away with the thought that every case is different, so we just have to follow our hearts. Nice to hear a perspective from the “other side of the pond” as they say. Thank you, Marie! Well done, Marian! I like how you wove together your own experience and feelings about giving to the homeless with your review of An Invisible Thread. An amazing story of grace in action by Laura Schroff. So glad you liked this book too. Thank you, Sherrey. I was particularly pleased that the author herself chimed in on the discussion – and not once but twice. What a kind and opened-hearted woman she is.